Jim comes in telling Helen that he's just seen a police car in the street. 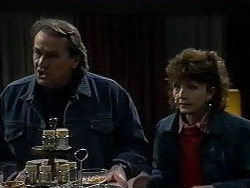 Helen asks Jim who he was out with tonight and he admits that he was out with a woman called "Cynthia". 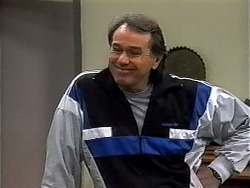 Todd and Josh rush in and tell Jim that Doug has been taken to the police station as a result of a practical joke. Helen worries that there might be a real prowler still out there but Todd and Josh says the girls were probably just freaked out after watching horror movies. Adam and Cody are still laughing about getting Doug arrested, but Melissa thinks they'll be in a lot of trouble. Just then, Doug comes in. DOUG: YOU'VE GOT SOME EXPLAINING TO DO!!! Pam is also there and Cody complains that Doug was spying on them. DOUG: IT'S BESIDE THE POINT WHAT I WAS DOING! THEY EVEN FINGERPRINTED ME!! The girls suddenly realise that there must be a real prowler still out there, but Doug is more worried what the gossip- monger of Erinsborough will say about him. Pam had to drive back from the mountains to sort things out with the police! DOUG: I CAME THIS CLOSE TO SPENDING THE NIGHT IN THE LOCK- UP! ADAM: (calmly) Dad, you asked for it. DOUG: Like hell I did! Adam explains that Doug asked to be punished for Adam's hand injury, so this was his punishment! Pam is forced to agree. DOUG: Oh, a fine to time to start doing what I ask after all these years! Everyone has started laughing and Doug glowers at them. Jim sees Doug jogging and comes over to ask him about his arrest! Dorothy overhears that there may have been a prowler last night and comes over looking worried. Doug thinks it's just the girls letting their imaginations run riot. 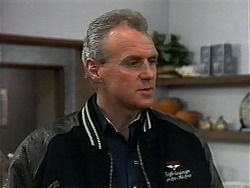 Jim has got a mate on the police force so Doug asks for his name - Sergeant Mooney. Adam and Pam are chatting. Caroline is going to help Adam finish typing his notes on the office machine and Pam is a bit put- out. Doug comes in and tells Cody and Melissa (who are having breakfast) that it's a beautiful day and he's not angry about last night anymore - it was a quite funny after all. Cody looks sceptical! He asks Cody what her plans for the day are and she says she's going out but will be home about 12pm. Paul comes over to invite Jim to watch a video this afternoon, but they decide on this morning instead as Jim has a luncheon date. Paul asks what his new woman is like but he won't give him any details. 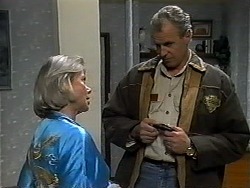 Helen tells Jim that he could bring Cynthia around to the house and she'll cook for her. Surprisingly, Jim agrees. Doug is looking for his keys and Pam tells him that Adam found them and put them on the bench. He rolls his eyes. Pam is reading a medical dictionary to see how much it's all changed since she trained. Dorothy pops around to talk to them about the prowler last night. She earnestly tells them that they have to do something and is calling a Neighbourhood Watch meeting. Doug decides to make a sharp exit(!) 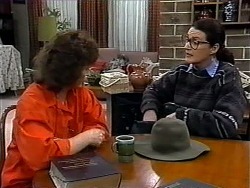 Dorothy asks Pam to help her to type some stuff up. 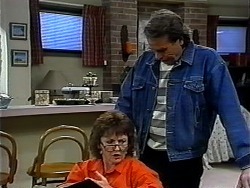 Jim and Helen comment to each other that Paul seems to be in a better mood and hope that he's getting over Isabella. Jim asks Helen to do lunch for 2pm for Cynthia. He smiles quietly to himself and tells Helen that Cynthia has great teeth(!) Helen probes for details, but he is unforthcoming. 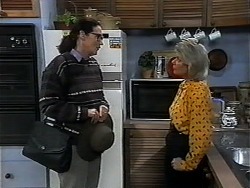 JIM: Helen, all your questions will be answered when you and Cynthia get together! In the living room, Todd and Josh are messing about with the horror mask again but hide it quickly when Helen appears. 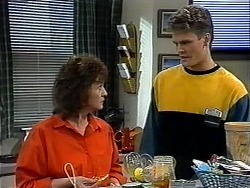 Todd asks if he can go to Josh's for lunch and Helen agrees. When Helen has gone, Josh and Todd wonder if they should own up about being the prowler, but decide not to risk it. 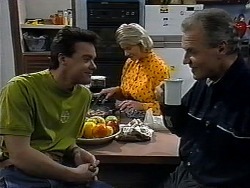 Paul tells Jim that he is a bit of a dark horse and Jim rolls his eyes, saying that Cynthia is none of his business. 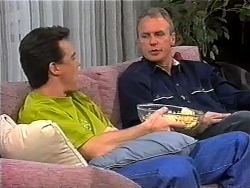 Paul thinks Jim should play the field a bit, but Jim says that he's having a lot of fun with Cynthia. He offers to set up a double date for them both with Cynthia and her sister! Cody and Adam are washing the car when the police arrive. They tell Cody they've come to take her down to the station for perverting the course of justice last night. They push her into the police car. CODY: Adam! Adam do something, please! Get mum, get Dad! (seeing Doug coming down the drive) Dad, help me! 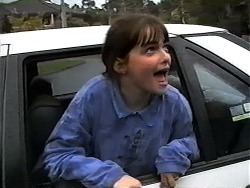 But the car drives off with Cody in it! Doug laughs and Adam realises that Doug set the whole thing up! Doug is crowing about pulling the best ever practical joke. It seems that the police only drove Cody around the block and then brought her back. Now she's sulking in her room. Adam tells Pam that Caroline is having trouble with the medical terminology and asks Pam to help him out again. Pam is very pleased. 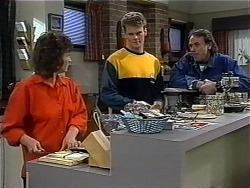 Paul tells Helen that Jim is trying to line him up with Cynthia's sister, Michelle. Helen thinks there's something odd going on - Jim seems altogether too casual when he talks about her. 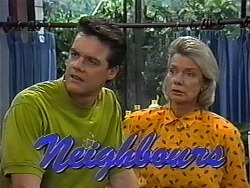 Dorothy pops in to talk to Helen about Neighbourhood Watch so Todd and Josh try to make a sharp exit. But Melissa sees the bag with the mask in it and tells them off for scaring them. They beg her not to tell Dorothy. Jim comes in through the back door with a bottle of wine for their lunch. He tells them that he wants Cynthia to move in with them - as soon as possible. Helen and Paul look shocked.